An old, wooden bus is used to assist in the walk… and the experience is really worth it! The visitors are transferred in one of the quietest regions of Nicosia. Firstly, in the most historic neighbourhood of the city within-the-walls and then in Kaimakli, a "village" within the municipal limits of Nicosia. The visitors get to know from up close the Municipality's efforts for renovating traditional buildings and constructing new ones, and the maintenance, preservation, and revitalisation of the neighbourhood that is done through Nicosia's Unified Regulatory Plan. Young families relocate in the neighbourhood, giving a new life in a region that was greatly affected by the 1974 Turkish Invasion. In Kaimakli, at the centre of the village, some of the most significant structures of urban architecture from the ending of the 19th century and the beginning of the 20th, built by its most known craftsmen, are still preserved. Walking in Chrysaliniotissa and Kaimakli, the visitor is familiarised with the Municipality's efforts to assist the preservation and maintenance of the old buildings. 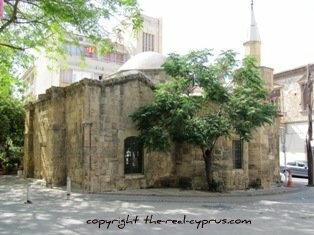 The Nicosia walk aims to provide to the visitor the opportunity of having a general image of the city within the walls and its development from medieval times until today through buildings, monuments, and churches that are located in the old city. The visitors also have the chance to visit workshops and stores where craftsmen continue working in the traditional manner, such as candle makers, shoemakers, blacksmiths, chair-makers, coppersmiths, and tailors. The walk aims to present that development that begins in the end of the 19th century and continues until today. A special emphasis is also given on the prehistoric era of Nicosia and the development of the first Bronze Age settlements along the Pediaios River, as well as on the excavations that brought to the light the constant and uninterrupted growth of the city from ancient times until today. The bus rides outside the walls and through the east portal, the Pafos Gate, the visitors then walking along the Pediaios River, riding the bus through the governmental buildings and the excavations on St. George's hill, and leading to the Presidential Palace and the English School. After a brief walk in the Agioi Omologites neighbourhood, the bus returns to the centre of the town. Don't forget to wear comfortable shoes or trainers and make sure you have plenty of water with you. Don't forget to take a map with you, after your guided walks around Nicosia, something will no doubt catch your eye and you will want to return to see it again, so best you know how to find it again. You might want to print this off before you set off on your travels. Here Is A Basic City Map thanks to the CTO for text.